Yeah, these are the old good Crowded House, although it is hard to believe this. That very Australian pop-rock ensemble that was gathered in the middle of the distant eighties, announced the collapse and then reunited ten years later. The 2007 album, Time On Earth, made it clear: the idea to bring Crowded House back to life worked out efficiently. That CD confirmed the fact that the band still possessed interesting ideas and abilities to materialize them. The musicians did not manage to restore their prime shape, which they demonstrated, according to critics and listeners, with the 1991 effort, Woodface). It possibly could be that they even did not try to do it realizing that their best time is far behind and there is no possibility to bring anything completely new to the table. So they simply recorded a nice CD that pleased the fans of the Australian outfit not only with the material itself but also with the very fact that Crowded House still exist and keep working. Soon, it was disclosed that the story had a continuation. By the summer of 2010, the musicians prepared one more album. 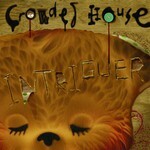 The new long player from Crowded House, their sixth studio effort, is called Intriguer. It recorded by the people we already got used to see: the ensemble’s leader Neil Finn and the other guys Mark Hart and Nick Seymour. The only replacement is Matt Sherrod, the drummer who was invited to replace the passed away Paul Hester three years ago and now acting as the band’s regular member. In fact, Hester’s absence still takes a toll on the atmosphere of the Crowded House music. This is the reason why some of the compositions of the new album sound particularly depressive, for instance gentle Falling Dove with the touches of folk-rock, or Isolation with light electronic background to silence partially the guitar, which forms an effect of mystique. Meanwhile, you can easily find and enjoy optimistically tuned stuff as well. The best example from this category is Either Side of the World with touches of explosive samba. The other worthy songs are the lead single Saturday Sun and gentle epic Archer’s Arrows. Crowded House afforded themselves a few experiments, but did not go too far out of the line. Intriguer explicitly demonstrates the traits of the band’s classic period music with accents made on tuneful choruses and variety of rhythms to avoid the monotonousness. If Time On Earth is an album that continued the line of Finn’s solo career, Intriguer is a hundred percent Crowded House record that was written by the efforts of the ensemble’s each member. Of course, Finn remains the creative driving force behind Crowded House. He is amazingly good at doing what pioneers of rock-music used to do on an unsurpassed level: using simple words to explain grand rules of life and answer most difficult questions. Only when this simplicity comes from the heart it does not sound like something banal, and sincerity is the greatest value of Finn’s poetry. Nicely aware of the fact that they reached the peak of their career long ago, the musicians of Crowded House recorded an album that simply follows the track of their strongest releases. They were made some twenty years ago, but even today Intriguer will definitely find its audience. This is because the band’s collapse was too premature an event that turned into a real tragedy to the outfit’s multiple followers. The return of Crowded House to their listeners is already a holiday by its essence; and the two albums made afterwards prove that it was the only right, albeit tough, decision made by the talented musicians.